The Wesson Roman Console Table by Four Hands at Alison Craig Home Furnishings in the Naples, Fort Myers, Pelican Bay, Pine Ridge, Bonita Spring, Golden Gate, Estero, Cape Coral, Marco Island, Sanibel/Captiva Island, Point Charlotte, Ave Maria, Florida area. Product availability may vary. Contact us for the most current availability on this product. 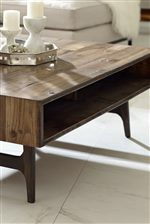 Defined by reclaimed oak woods and a mix of metal and roble wood bases, Wesson strikes an intriguing cross point of rustic minimalism. The result is a versatile contemporary look that touches on industrial and mid-century modern design elements. Infinitely relaxed and livable, yet decidedly sophisticated, Wesson is at the forefront of rustic refinement. The Wesson collection is a great option if you are looking for furniture in the Naples, Fort Myers, Pelican Bay, Pine Ridge, Bonita Spring, Golden Gate, Estero, Cape Coral, Marco Island, Sanibel/Captiva Island, Point Charlotte, Ave Maria, Florida area. Browse other items in the Wesson collection from Alison Craig Home Furnishings in the Naples, Fort Myers, Pelican Bay, Pine Ridge, Bonita Spring, Golden Gate, Estero, Cape Coral, Marco Island, Sanibel/Captiva Island, Point Charlotte, Ave Maria, Florida area.